Pending a change of heart, forward Artemi Panarin is likely to become one of the most hotly pursued NHL free agents in recent memory on July 1st, 2019, with a sweepstakes potentially rivaling even that of John Tavares’ last year. His current team, the Columbus Blue Jackets, have done their best to convince Panarin not to test the free agent waters and instead sign an extension, but thus far it seems like a highly unlikely outcome. As a result, Columbus is saddled with the difficult choice this season of whether to hold on to Panarin for a run at the Stanley Cup and risk losing him for nothing or trade the talented winger for a hefty return while also damaging the team’s title hopes. However, that dilemma could have instead belonged to the Chicago Blackhawks. Panarin was only traded to Columbus in the 2017 off-season. The Russian dynamo was originally signed by and played his first two NHL seasons in Chicago. However, the Blackhawks decided to deal Panarin away, opting instead to bring back Brandon Saad from the Blue Jackets, as well as young goaltender Anton Forsberg and a mid-round pick. By any metric, it is difficult to say that the Blackhawks won that trade, as Chicago missed the playoffs last season amid a very disappointing campaign for Saad, while Panarin was one of the league’s top scorers for a Columbus squad that performed well all season long. Yet, Blackhawks GM Stan Bowman may have had more than just the trade return in mind when he dealt Panarin to the Blue Jackets. Speaking with TSN, Bowman claims that he foresaw the “tough spot” that Columbus and colleague Jarmo Kekalainen are in right now with Panarin. 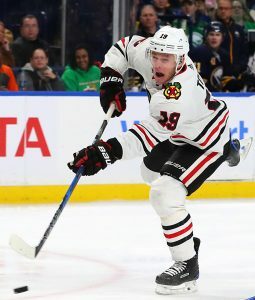 The young forward made such an immediate impact when coming to the NHL, that Bowman expected he would test the free agent market as soon as possible, saying ” I saw that coming as a challenge.” This clearly was a major factor that contributed to Chicago’s surprising willingness to trade Panarin. For his part, Bowman does acknowledge that Saad has to play better and has been more than a little disappointing thus far in his second stint with the Blackhawks. Continued poor performance from Saad would make this trade a complete loss, even if Panarin does bolt from Columbus. However, Bowman still stands behind his decision to acquire a talented forward signed long-term at a $6MM cap hit in Saad rather than take his chances with Panarin, who felt was destined to depart in free agency. 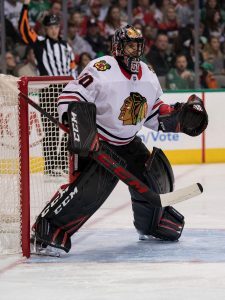 The Chicago Blackhawks got more good news today as The Athletic Scott Powers reports that head coach Joel Quenneville said that goaltender Corey Crawford could practice with the team as early as Monday. Crawford who has been out since Dec. 23 of last year with concussion symptoms said earlier this offseason that he likely wouldn’t be ready when the regular season begins as the symptoms have still affected him. That has been the case, but if Crawford is close to returning to practice, that could be a good boost for the team, knowing that he’s not far off to returning to game action, even if its a few weeks into the season. The 33-year-old Crawford was having a solid season before going down as he posted a 2.27 GAA and a .929 save percentage in 28 games. If he can come back and post anything close to that, the Blackhawks may be able to work their way back into playoff discussions this year. Fox Sports’ Jon Rosen reports that Los Angeles Kings prospect center Gabriel Vilardi, who has missed the entire preseason after re-injuring his back this summer, was in full gear working out on the ice with head trainer Chris Kingsley. There is no timetable on his return. Rosen added that Vilardi will either start the season on IR or as an injured non-roster player. The 19-year-old still has one year of junior eligibility, but posted 52 points in just 32 games last year with the OHL’s Kingston Frontenacs and many feel could be ready to take on a key role with Los Angeles if he can put his back issues behind him. Adrian Dater of BSN Denver writes that winger Sven Andrighetto will miss two to four weeks with a foot injury. The 25-year-old is trying to force his way into the team’s top-six . He tallied eight goals and 22 points last year in a bottom-six role for the Avalanche. Last summer, the Sharks moved quickly to get a pair of core players locked up as soon as the window to sign contract extensions opened up as they inked defenseman Marc-Edouard Vlasic and goalie Martin Jones to long-term deals. It appears they may be heading down that route again this summer as Pierre LeBrun of TSN and The Athletic reports (subscription required) that talks on a new deal are progressing with center Logan Couture and that they’re hoping to have a deal done for July 1st, the first day an extension can be made official. The 29-year-old has been a fixture in San Jose’s lineup for the better part of the last decade after they made him the ninth-overall selection back in 2007. He’s coming off of a career year in goals (34) and adapted well when he was asked to spend some time on the left wing. Couture is set to earn $6MM in 2018-19 and will undoubtedly get a raise from the Sharks on this new contract. Still from LeBrun, the Jets have yet to begin contract talks with pending UFA center Paul Stastny. The 32-year-old played a key role for Winnipeg in their postseason run but with Mark Scheifele and Bryan Little locked up long-term, it’s hard to imagine there’s room for him unless they find a way to move a sizable contract out. Stastny is set to hit the open market as the top pivot not named John Tavares and will draw plenty of interest around the league. Among the pieces that the Hurricanes are interested in from Chicago in their trade talks regarding defenseman Justin Faulk and goaltender Scott Darling is winger Brandon Saad, reports Mark Lazerus of the Chicago Sun-Times. The 25-year-old failed to have the type of impact the Blackhawks were hoping for when they reacquired him last year as part of the Artemi Panarin trade. However, after averaging 51 points over the previous four seasons, it’s reasonable to expect that he will have a bounce-back campaign in 2018-19, something that Carolina likely believes as well. With Seattle’s expansion application almost ready to turn in to the NHL and the general belief that Seattle will have a team in place in the next few years, the Hockey News’s Sam McCaig recently ran a story with suggestions for potential nicknames for the possible expansion team. With an expansion fee of $650MM, Seattle better make sure they make the right decision when it comes to their team name. McCaig writes that there are several good name possibilities, including the Seattle Emeralds, Seattle Totems and the Seattle Rainiers. The Emeralds would be a reference to the fact the city is known as the “Emerald City.” The Totems would be a salute to the Pacific Northwest, while the Rainiers would acknowledge Mount Rainer, the highest mountain in Washington state. Other possibilities mentioned in the story would be the Seattle Evergreens, the Seattle Kraken, Seattle Renegades and the Seattle Sea Lions among others. Some might make good fits, while others come off as unrealistic, but regardless, assuming they are approved, Seattle will need a name at some point. The Athletic’s Scott Powers (subscription required) writes that for the Chicago Blackhawks to earn themselves a playoff spot this season, they must fulfil a 10-point plan for the remaining 33 games of the season. The Blackhawks, currently in last place in the Central Division with 53 points, are seven points removed from a wildcard spot and will have a tough time making up the ground, but it isn’t impossible. The scribe writes that the estimate is the team will have to go 20-12-1 over the next 33 games to reach the playoffs, a tall order, but not impossible. Obviously, the return of goaltender Corey Crawford will be critical and that looks like a real possibility soon. Among some of his other key points, Powers writes that Brandon Saad must start playing better in the second-half of the season. His 13 goals and 10 assists is currently heading for one of his worst seasons ever. Powers also suggests a trade could help, but only if it doesn’t involve one of the team’s top prospects. The team had every reason to make those types of trades in the past, but no longer. Seemingly out of nowhere, the Chicago Blackhawks have placed All-Star goaltender Corey Crawford on the injured reserve today, the team announced. The team has recalled J-F Berube from the AHL’s Rockford Ice Hogs and he and Anton Forsberg will man the Chicago net for as long as Crawford is out with his unidentified injury. 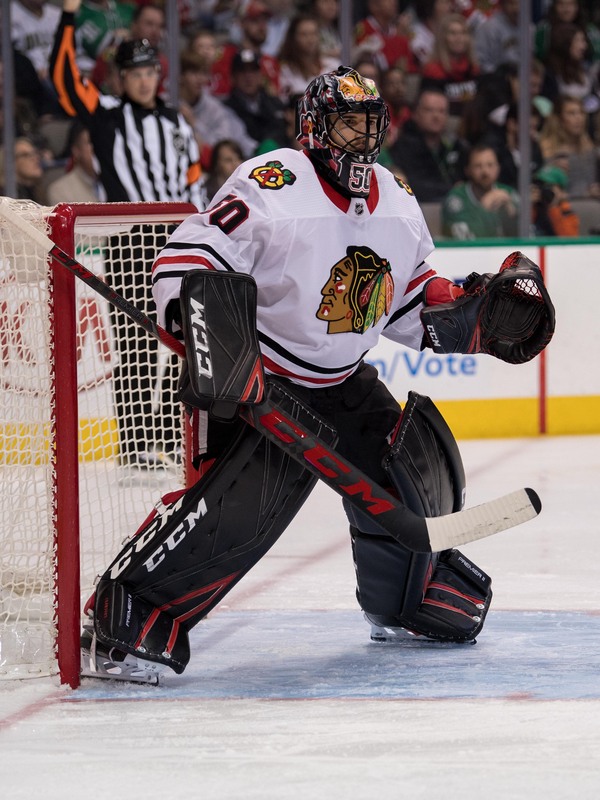 Crawford not only played all sixty minutes for the Blackhawks last night, but even put in some extra time in an overtime loss to the Dallas Stars. At no point was there any clear injury to Crawford, nor did he leave the ice for any span of time. Yet, the Chicago keeper is headed to the IR, putting his team in a tough spot for an indeterminate amount of time. While Crawford has easily been a top ten NHL goalie this season, single-handedly winning some games for the defense-deficient ’Hawks while posting a truly impressive .930 save percentage. Now, he’ll be substituted for two new players to Chicago that have yet to impress. Forsberg, a piece of the Artemi Panarin–Brandon Saad deal, has struggled mightily as Crawford’s backup so far. He has just one win and a 3.67 GAA in five appearance. He’s now the impromptu starter, with Berube – who has been nothing more than pedestrian in the AHL – as the primary backup. Until more is known about Crawford’s condition, this is a scary situation for the Blackhawks, who now have an inexperienced and struggling duo behind an inconsistent defense. Always known for their offensive prowess on the ice, the Chicago Blackhawks have hit hard times. Sure, the team isn’t at the bottom when it comes to team scoring (13th overall), but the usual names aren’t showing up in the box scores, according to Mark Lazerus of the Chicago Sun-Times. Patrick Kane broke out of his slump on Wednesday with a pair of goals, but he had been fighting a one goal in 10-game slump. Jonathan Toews has two goals in the past 16 games, while Richard Panik hasn’t scored in 12 games. Nick Schmaltz has one goal in 17 games, while defenseman Duncan Keith hasn’t scored yet this season. Throw in Brandon Saad and Nick Schmaltz, who each have one goal in the last 15 and 17 games, respectively. Lazerus writes that despite their offensive struggles, the team has been winning, going 3-1-1 in their past five games, which takes a lot of the pressure off the players. With Kane’s two-goal game, many players hope that signifies that the end of some of these slumps may be forthcoming. James Gordon of The Athletic (subscription required) writes that while many people are blaming the Ottawa Senators for the team’s struggles this year, that’s not where the blame should be pointed. The scribe instead looks at the team’s goaltending, particularly the play of veteran Craig Anderson, who last year put up an impressive season in which he had a 2.28 GAA and a .926 save percentage to lead the team into a deep playoff run. Fast forward to this year and the 36-year-old goaltender has a 2.94 GAA and a .896 save percentage. Backup Mike Condon isn’t faring any better and his analysis suggests that both goalies are just making inexcusable mistakes. Tampa Bay Lightning defenseman Jake Dotchin (undisclosed injury) has been placed on injured reserve, according to Tampa Bay Times’ Joe Smith. Smith also says that Dotchin will be eligible to return on Tuesday and might return by then, but he will sit out two games before he is eligible to return. Cory Conacher will take his place on the roster.